Over medium high heat, melt butter and avocado oil. Add onions and 2 minced cloves of garlic. Saute’ until golden and cooked through. Spray baking dish with non-stick cooking spray or avocado oil. In a small mixing bowl whisk sour cream smooth. Add 1/2 cup of the Parmesan cheese, salt and pepper, Italian seasoning, 2 minced cloves of garlic, garlic powder and cornstarch stirring to mix well. Place sauteed onions in bottom of baking dish. Lay chicken breasts over onions in baking dish in a single layer. 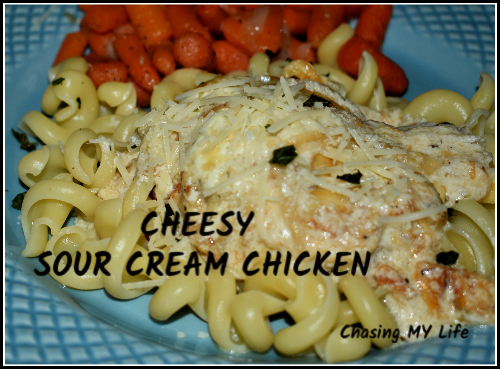 Top each with a slice of Provolone or Mozzarella and smother the chicken with the sour cream mixture. Top with 1/4 cup remaining Parmesan. Uncover and bake 30 minutes more until chicken is cooked through and cheese is golden. Top with chopped parsley for garnish. NOTE: If using chicken tenders, slice Provolone or Mozzarella slices into smaller pieces to fit. You can also use grated cheese.